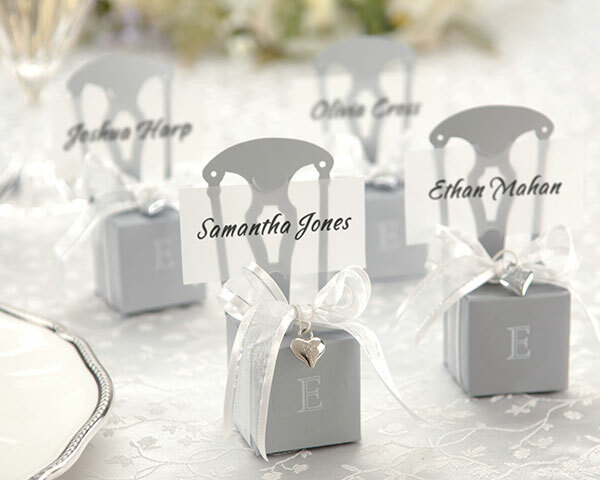 Mini Silver Chair Favor Box (Can be Monogrammed) - EconoBride - Budget friendly wedding favors. The ideal favor is one that looks beautiful on the table and is still incredibly functional. This is it. These miniature silver chairs not only act as placecard holders, with their included vellum strip which serves as a place card, but inside the seat of the chair they hold several ounces of whatever favor filling you want. Fill them up with flower petals, candies, seeds, potpourri or with chocolate, mints...almost any wedding favor you can think of! Chair comes with an elegant silver and white ribbon and a charming silver heart charm. Measures approximately 4 1/2" tall when constructed and is sold in sets of 12. Fillable box measures 1 1/2" square. This item can be personalized with a monogram vellum seal for that extra special touch. Monogram seals are sold in sets of 12 to coordinate with favors. Assembly required.